The CNC dovetail machine is a multi-function Drawer Box Machining Center, The machine can be configured to do Dovetail, French Dovetail, ,straight dovetail and other styles as required. There are 2 zones standard in this dovetailer allowing for pendulum processing. While the one part is being machined, the other zone can be loaded and queued for machining. The CNC Controller is configured to run the whole process automatically, easy operation for anyone. Elimination of complicated machine setup saves cost of labor. 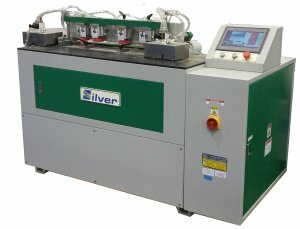 Saves valuable Manufacturing Floor Space by combining all operations into one machine. Simple to operate ,simple to maintain. Feeding speed is adjustable for cutting various materials. The spindle is adjustable for cutter wear compensation. The cutter can be sharpened about 12 times. 10.2” High resolution Touch Screen,It is easy for operation. Easily-used software allows the operator to change from one saved program to another in seconds with only two touches to the screen. A password protected edit feature allows quick and easy editing of existing programs or creating new programs. A new program can be created from scratch in less than one minute with very little training. The use of precision screw in combination with an encoder for dramatically upgrading accuracy. Error message display facilitates trouble shooting.